Hundreds of groups (family reunions, neighborhood friends, singles clubs, social clubs, etc.) have rafted with us since 1983. We have two beautiful, riverside base camps that have comfortable space for socializing before and after raft trips. 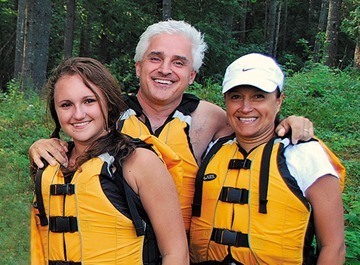 Check out the discounted rafting rates for groups (12 or more rafters) of friends and family. Why choose Crab Apple for your Friends or Family trip? Adult $92, Children under 16 $72 and 1 Free trip for every 12 rafters. Dead River prices do not include $12pp state and river access fees. Our Most Popular Group Trip: The Fife Brook trip is perfect for groups of Family and Friends with varied ages and athletic abilities. Many groups return for this trip year after year for great fun and camaraderie. Half Day Kayak Adventure: Our Funyak trip is the perfect half-day adventure. Perfect for groups meeting in the Berkshires looking for a fun afternoon activity. West River (Jamaica, Vermont) Action Packed Intermediate Trip: The West is a special trip for groups looking for aggressive intermediate whitewater along with great views through Jamaica State Park. The trip meets at Mount Snow Ski Resort on two weekends each year – a perfect place for meetings and relaxation.